Mike leads a team that is focused on identifying and developing integrated solutions that brings together technologies in crop protection, seeds, and traits to add value to growers. Prior to his current role, he was Head of Technology and Innovation where he facilitated cross-business technology development. He also was Head of Crop Protection Biological Research and Development in the USA where he managed the biological characterization of active ingredients and traits. Mike has held several roles in R&D and Marketing including Global Fungicide Development Manager, Insecticide Technical Brand Manager and Field Research Scientist. 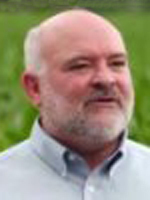 He was Assistant Professor of Plant Pathology at the University of Florida prior to joining Syngenta. Mike has a Ph.D. in Plant Pathology from North Carolina State University. He owns Windy Hill Farms, LLC, a 212 acre farm in Randolph County, NC, where he raises registered Angus cattle in his spare time.